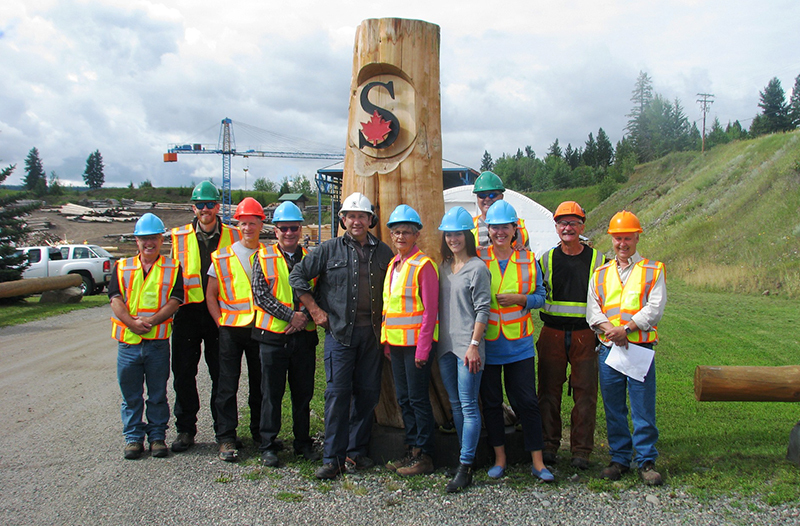 (100 MILE HOUSE) The Jobs Creation Partnership (JCP) Project is marking a milestone with the construction of a log building to be installed at Canim Lake. Chief Michael Archie (Canim Lake First Nation, Tsq’escenemc) and MLA Donna Barnett (Cariboo-Chilcotin) were among the dignitaries who inspected the structure today (July 21) at the Sitka Log Homes site in 108 Mile Ranch. The building shell is 22 feet by 28 feet. The log structure will house washrooms to be installed at the Canim Lake recreation site. It’s one of dozens of new amenities for heritage and recreation sites being constructed under the JCP Project. The $400,000 initiative – the largest such project in B.C. – is providing employment and skills training for five participants in the Cariboo. “This project is creating improvements to the region’s heritage tourism and recreation infrastructure that will help First Nations communities like Canim Lake attract more visitors and generate more employment,” said Cheryl Chapman, NPTGS First Nations Co-chair. The participants are working on four separate phases that will see upgrades to heritage/recreational sites and First Nations communities in the region. They’ll gain experience in log building and trail construction as well as learning other valuable skills during the 36-week project. NPTGS Co-chair Terry Raymond said the participants are learning some of those skills building the log structure. Barnett said the JCP program helps both workers and employers. The JCP Project is a partnership between the Ministry of Social Development and Social Innovation, the New Pathways to Gold Society (NPTGS), Canim Lake First Nation, Gold Rush Snowmobile Trail Regional Management Committee, Highway 24 Ice Caves Project and the Government of Canada. The Recreation Sites and Trails Branch of the Ministry of Forests, Lands, and Natural Resource Operation are also project partners. Since being founded in 2007, NPTGS has raised and/or leveraged over $4.5 million for projects and contributed nearly $3.55 million to local communities. Working with its partners, the Society has also built or restored over 230 kilometers of heritage trails, launched and/or completed 18 major projects and staged 165 events, performances, symposia and lectures.